Presumably one could make a low-voltage “sense” output by monitoring the current draw, or possibly by a small induction coil w/ smoothing circuit. The voltage multiplier puts out maybe 8-10kv, not much, really. 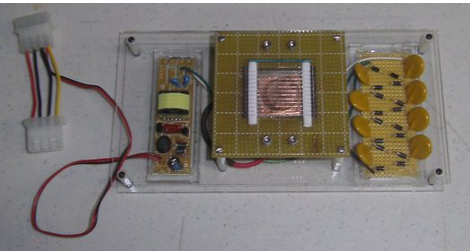 Detection can be accomplished just like a geiger tube, watch the voltage drop through a capacitor. Thanks for noticing the link problem (the mods fixed it). The measured voltage out was almost 8kv. When testing the design I left off the current limiting resistor and hit the power. The arcing was great but not as I intended. Caution is necessary when dealing with high voltages. This may not seem high but it is dangerous. I need to emphasize safety more. Do smoke detectors (non-IR sensor) emit alpha particles? If so, they could use one to test it. There are many that use a small(1 micro Curie) sample of americium in them. Please don’t take apart your smoke detector! You could accidentally break the source and contaminate your surroundings. These sources are not meant to be handled! If you’d like to to radiation experiments, invest in a safe sealed check source. These are usually discs of radioactive material potted in epoxy, with a plastic housing. They are OK to handle and won’t contaminate you or your surroundings. Polonium 210 is a great source for alpha particles. check around for better deals online. There are plenty of forums and mailing lists that can help you find a good check source. Smoke detector Am-241 sources are sealed sources, built to a higher standard of ruggedness than many of the alpha check sources one can buy. They’re far less expensive, and eminently suitable for hobby use. In my mind, the only reasonable impediment to sacking a smoke detector for the source is the interpretation of the NRC’s administrative code regarding whether or not the smoke detector body, etc. are part of the “source.” One observes all manner of amateur lawyering and manufactured grief on this subject, but I’ve never seen any official communication from regulators enjoining the reuse of a smoke detector source. A possible alternative to a Cold Cathode power supply might be the flashgun assembly from disposable cameras. There are many alternatives to powering the device. I chose the CCFL because it was handy and already wired for a PC power supply. The basic idea was to create lab equipment to run off the PC supply. There are many examples of high voltage supplies on the net using ignition coils, flyback transformers and hand wound coils. For lab equipment, I chose reliability (consumer products). I just got my cloud chamber working a day or two ago, now I gotta build this…I love this site! After you finish this build, the Truly Mad Scientist’s LVL1 Splinter Group will be posting a geiger counter and laser build. Mixing the two will then follow (unless we get sharks with head gear). Sorry if this is a dumb question but when would this be useful?